Theft of business-critical stock and equipment. Unauthorised access to sensitive areas of your premises. Fire damage to good, premises and possibly endangering lives. Mac Alarms has over 20 years experience securing businesses throughout Ireland. Our qualified Security and Fire personnel will work with your company to find the right integrated solution to protect your business from intruders, fire and unauthorised access. For security and intrusion detection we supply a wide range of Intruder Alarms, CCTV and Access Control products. 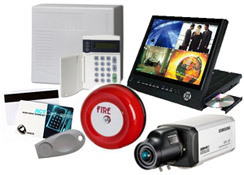 We also supply a range of Fire products for fire detection. Mac Alarms offer 24×7 Monitoring on all fire and security systems at our Monitoring Station in CityWest providing coverage for businesses throughout Ireland. Our commercial monitoring service is very affordable from only €230 plus VAT per year. Mac Alarms supply a number of popular security products and alarm systems at special rates via our online store. Visit our Online Shop to check out the latest offers. Contact Mac Alarms to discuss a security solution for your business. We can arrange a site visit to properly assess your needs and then provide a no-commitment quotation. Call 045-441479 or email sales@macalarms.ie today. "We had numerous break-ins to our showrooms and it caused serious disruption to our business. Mac Alarms supplied us with a monitored security system. We can now lock up each night knowing our premises are safe."